Walnut Street Books, 9781947597013, 184pp. 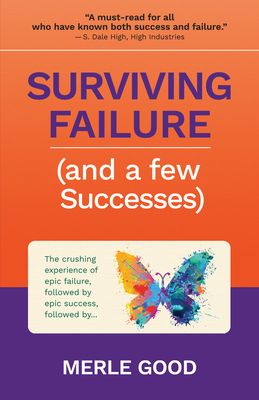 Surviving Failure (and a few Successes) is a bracingly honest book about the struggles of failure and of wild success. It is also a story of hard-won hope and endurance. Here, too, for the first time is the inside story of the off-the-charts publishing sensation, Fix-It and Forget-It Cookbook. Good acknowledges the searing questions he faced in the dark times and in the moments of out-of-control success. Who can I trust—and who will trust me? When the false gossip is overwhelming, do I ignore it, or do my best to counter it? The author offers transferable survival tips, weaving in advice from well-known figures who experienced failure yet went on to live productively and positively. Merle Good is an author, publisher, and playwright. He was the publisher of the phenomenally successful Fix-It and Forget-It cookbook series, which produced a #1 New York Times bestseller and sold more than 10 million copies.